Once one of the greatest port in the world, Liverpool (pop. 441,000, with suburbs 1,362,000) is now the fourth largest conurbation in England (after London, Birmingham and nearby Manchester). The inhabitants of Liverpool are officially known as the "Liverpudlians", but more commonly known as "Scousers". Few English cities have such a unique character as Liverpool. This could be due to the large influx of Irish and Scottish immigrants in past centuries, or to the very distinctive local accent, called Scouse, almost incomprehensible by most other speakers of English (in addition to the rising and falling tones, a word like "town" is pronounced "toon", "back" sounds like "bax", "technology" is "texnology" and "get" is "gerr"). Liverpool's past glories have come to an abrupt end after WWII, and the subsequent high unemployment and poor economic situation have made it a bastion of radical left-wing politics. But it is best known to the world as the city from where The Beatles originated. 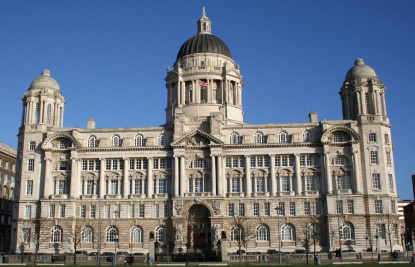 Liverpool is a relatively new city by European standard. It was only founded in 1207 and immediately followed by the erection of Liverpool Castle in the 1230's. If you are wondering where the castle is, it was demolished in 1726, but used to stand on Derby Square (Queen Victoria Monument). Liverpool remained a minor village subordinate to Chester until the 1650s. The real development only started after the Restoration. In the 18th century, Liverpool had become a major port and was thriving on the triangular trade between Europe, Africa and America (manufactured goods, slaves, sugar/tobacco/cotton) along with Bristol. 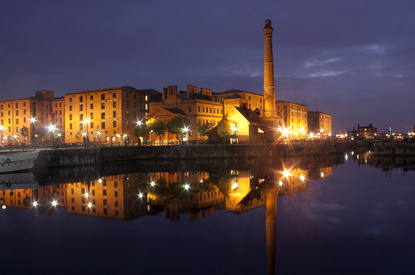 The first wet dock in Britain was built in Liverpool in 1715. At the beginning of the 19th century, 40% of the world's trade was passing through the docks at Liverpool. The city soon acquired one of Northern Europe's first Black community through the slave trade. From the 1830's to 1930, 9 million emigrants from Wales, Scotland, Scandinavia, and other parts of Europe (including Russian and German Jews) came to Liverpool to sail for the Americas or Australia. The city's population grew tremendously as a sizeable foreign community remained and non-European immigrants arrived from the Caribbean and China. 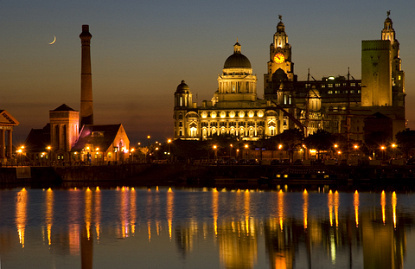 Liverpool was granted city status in 1880 and became independent from Lancashire in 1888. By 1930 the population of the city exceeded 850,000. During WWII, one million American soldiers passed through Liverpool preparing for D-Day. The 1950's, 60's and 70's were going to be gloomier for Liverpool. Air travel quickly replaced the profitable liner business, and the disintegration of the British Empire brought sharp decline to ship trading. Things having been looking up a bit since the 1990's, when EU development funds brought an new impetus to the economy. Liverpool is a reflection of its past glory. 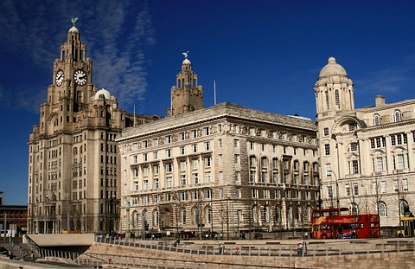 The landscape is dominated by the massive early 20th-century Royal Liver Building, Port of Liverpool Building (Mersey Docks and Harbour Board Company building) and Cunard Building on Pier Head. South of these three majestic buildings is the Albert Dock. Named after Queen Victoria's husband, Prince Albert, the docks opened in 1846 and were the first non-combustible (brick, stone and iron) warehousing system in the world. The warehouses were upgraded in 1848 with the world's first hydraulic warehouse hoist system. The docks were listed as Grade 1 Buildings in 1972. In the 1980's the entire site was redeveloped, with shops, restaurants, offices and the studios of Granada TV. The docks host four of th city's main museums, the Merseyside Maritime Museum, the Beatles Story, the Tate Gallery Liverpool and the Museum of Liverpool Life. The Albert Dock rank on top of Liverpool's attractions, with 4.5 million people visiting them every year. Just opposite Lime St Train Station, St George's Hall was completed in 1854 and claims to be Europe's finest Neo-classical building. 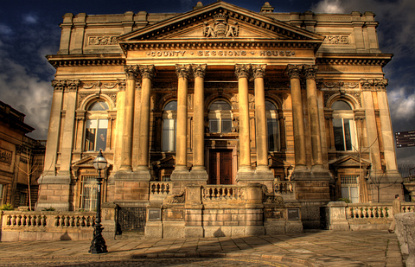 Crossing William Brown Street is the great Liverpool Museum, with over 100,000 items of archeology and ethnology, 500,000 specimens and items of science and natural history. The adjoining Walker Art Gallery has a startling collection of European painting ranging from Italian and Netherlandish Renaissance to Pre-Raphaelite works and 20th century paintings. It also boasts one of the most important sculpture collections outside London. Between the Lime Street and Central Stations, the Britannia Adelphi Hotel (built in 1912) was once ranked as one of the most luxurious hotel in the world. South of the Central Train Station is the district of Ropewalks, which has lots of bars and pubs. 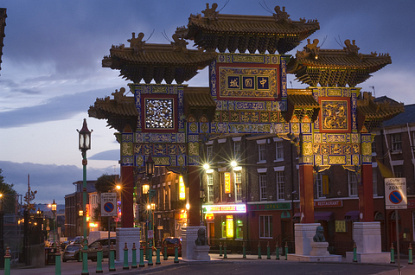 Further down, between Duke Street and Great George Street is Liverpool's Chinatown, which first Chinese immigrants came in 1866. A few hundred metres south-east of Chinatown is Liverpool greatest religious building, the Neo-Gothic Anglican Cathedral (as opposed to the concrete eyesore that is Catholic Metropolitan Cathedral). It was built between 1904 and 1978 following the design of Giles Gilbert Scott (1880-1960), who was the architect of innumerable churches in England, and also designed Britain's world-famous red telephone boxes. The cathedral is 146 metres long, slightly shorter than Westminster Abbey. Adding the adjoining Lady Chapel, the total length of the building reaches 189 metres (620 ft) making it the second longest church in the world after St. Peter's in Rome (211 m). Its bell tower rises to 101 metres - the second highest in the country after Salisbury. It is however the largest bell tower on the planet, and also boast the highest and heaviest peal of bells in the world, and the largest organ in the UK. Next to Liverpool Airport, in quite an unexpected location, you will find Speke Hall, Garden and Estate, a Tudor house with stunning interiors and beautiful Victorian gardens. It is simply one of the finest 16th-century mansion in Britain and shouldn't be missed. Beattles fans will want to visit The Mendips, childhood home of John Lennon. It is the place where some of the earliest Beatles' hits were first composed. You can also visit Sir Paul McCartney's childhood home at 20 Forthlin Road, Allerton. Access to either house is by minibus from Liverpool city centre or Speke Hall. Other attractions include the National Conservation Centre and the Western Approaches - Liverpool War Museum, which acted as the secret command HQ of the Battle of the Atlantic . Liverpool lies faces the Irish Sea, just above the Welsh border. It is connected to Manchester and Leeds via the M62 motorway, and to Birmingham, Lancaster and Glasgow via the M6. Trains runs between Liverpool and London Euston (4h45min, saver single £54), Manchester (45min to 1h, £7.90), Chester (40min, £4.15) and Leeds (1h45min, £18.90). National Express has direct bus services to London (4h45min to 6h45min, £21), Manchester (55min to 1h30min, £5.50), Chester (45min to 1h, £5.90), Lancaster (2h, £6.90), Leeds (2h10min to 3h30min, £9.90), Sheffield (3h, £9.40) and Birmingham (3h, £9.70).